With a list of positive quotes from famous-type people, James Victor Jordan has embraced marketing his book full-force. In fact, he approached us with a fully formed interview! Yet we had to ask our own questions, of course. A lawyer turned author, he embraced crime fiction writing full time. The pictures in this post are full color illustrations from his book, used with permission. Here are the questions and his eloquent answers. How did other writers have an impact on your writing? Other writers have deeply impacted my writing and still do. There are many; T.C. Boyle, of course. Toni Morrison, Madison Bell, William Faulkner, F. Scott Fitzgerald, Herman Hesse, too many to list. And that’s just fiction. I read a lot of nonfiction, too. How do you think the new changes in the publishing industry towards e publishing will affect your work? E -publishing will not affect what or how I write. But take my recently published novel, THE SPEED OF LIFE. The stories are informed by the eight illustrations in the book and the prose informs the illustrations. In the ebook, Kindle, the illustrations are in color and at present the book is only $2.99. In the printbook the illustrations are in black and white. Way too expensive to publish the print book with illustrations in color. The print book is presently $14.95. So I recommend the ebook if someone asks. Still the sales are about 50/50. What do you believe is the single most important event in your life that drew you towards writing? There is no single most important event that drew me to writing. I was always drawn to it. By 2000 I was too busy either to school (undergrad and law school at UCLA was seven years and then I was a lawyer, working long hours in a firm, trying to make partner. An after becoming partner the workload did not diminish.) But in 2000 I became ill, almost died. I did recover and that’s when I began to make serious preparations to become a writer of fiction. My wife was very supportive. Over a period of several years I completed the cases I had, taking no new ones and I enrolled in a masters of creative writing program at USC. So the illness, I would say, was an important event. If you knew beyond a shadow of a doubt that you would never make a dollar off your written word, would you still write? Where do you believe your creative force comes from? From the same place as my intelligence and empathy, wherever that is. I would characterize it as a special energy, mental, physical, and emotional, rather than a force. 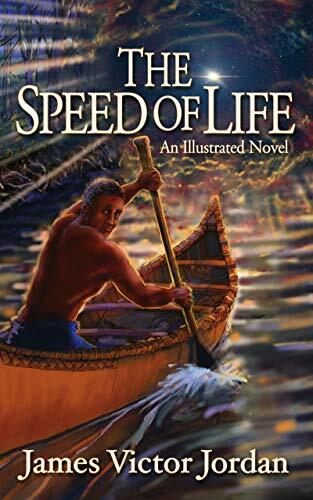 The Speed of Life, an Illustrated Novel is literary fiction in the cloak of a legal—or alternatively a psychological—thriller. At the outset the love of Estella, a federal prosecutor, for her twenty-year-old son, Andrew, is threatened when she becomes the victim of a savage crime that he is accused of orchestrating. Estella, Andrew, state, other federal prosecutors, and the defense lawyers are caught in a torrent of passion, a brutal legal system, the mythology of the Everglades, ancient shamanism, and the inhumane oppression of indigenous peoples in Florida and in Africa. When Gabriel García was asked what inspired him to write One Hundred Years of Solitude, he said: “Ice.” I cannot say that for me there was such a single moment of clarity. Over the years in short stories, I’d created a handful of characters who were still speaking to me, who wanted further development. I wanted to write about the Everglades as I grew up in south Florida, I wanted to write about shamanism, religion and spirituality because of my grandfather. When I imagined the crime, the novel came together. Are there any parts of the story that may be true to life for you? True to life? An excellent question. Superior fiction is about what is true, made up stories and characters that reveal truth. Based upon the overwhelmingly positive reviews of “The Speed of Life”, I’m going to venture the opinion that it achieves this lofty goal, that it is true to life. Is there a message in these pages that you would like your readers to know? Henry James opined that novels aren’t supposed to have a message, that the characters can have agendas, points of view, but that the author should be neutral. If that were true, then why have we canonized so many great polemics? The Grapes of Wrath, The Jungle, The Tortilla Curtain come to mind. I write to explore multiculturalism, justice, spiritualism, nature. Readers can expect to find those topics and themes in my fiction. What’s next? Any more books in the works? I am very excited about my new novel, still under construction. It’s titled The Hunter and the Hunted. It’s about a brother and a sister, twins, who are close until their father dies they have express fierce diametrically opposed views about how to settle his estate. The acrimony becomes so severe that eventually each twin comes to believe that the other plans fratricide. The brother is a semi-major character in The Speed of Life. So again, a character is telling me about his need to keep living in new literature. James Victor Jordan, a descendant of Eastern European shamans, writes fiction to explore justice, multiculturalism, spiritualism, and nature. His short stories have been widely published. He is an attorney holding a JD degree from UCLA and a Master of Professional Writing degree from the University of Southern California. He lives in Santa Monica, California with his best friends: Andrea, his wife and UC, their standard poodle.